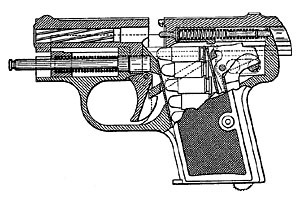 A 1910 British patent number 20660 was granted to Louis Schmeisser (the father of Hugo and Hans) for a vest pocket pistol design which was manufactured by Dreyse prior to World War I--the essential mechanism is the same as for the later Haenel Schmeisser pistol, but the method of disassembly is radically different. German patent 326536 was granted to Hans Schmeißer on 17 May 1919 for the method of barrel retention and disassembly used on the Haenel Schmeisser pistol. Three further German patents--337666, 342078, and 361175-- were granted to Gebrüder Schmeißer (the brothers Schmeisser) in 1919 and 1921 for the interlocking safety and magazine release on the pistol. U.S. patent number 1486497 was applied for on 26 August 1921 and granted on 11 March 1924 to Hans Schmeisser, covering both mechanisms. 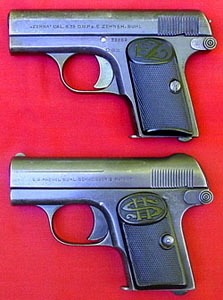 The Model I Haenel Schmeisser bears a striking resemblance to the Zehna pistol manufactured by Emil Zehner. However, both the Zehna and the Haenel Schmeisser are based on the earlier Louis Schmeisser design. The Zehna and the Schmeisser Model I appear to have been made during the same period. Walter states that Zehner’s business may have been sold to Haenel in or around 1925, though the gun was reportedly still listed in catalogues as late as 1927. A letter on Alain’s Littlegun.Be site states that Hugo Schmeisser was married into the Zehner family. 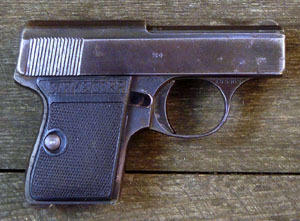 At first glance the Model I is a typical 6.35mm striker-fired unlocked breech vest pocket pistol similar to the 1906 FN Browning, but with an indicator to show that the striker is cocked. However, the barrel design is like that of the 1910 Mauser, with a vertical post beneath the chamber that fits into a hole in the frame, held in place by the recoil spring guide rod. The extractor is mounted externally on the right side of the gun, and there is no ejection port because the gun has an open-top slide. The Schmeisser brother’s first patented innovation involves the method of field stripping the gun--the recoil spring guide rod, which retains the barrel (like the Mauser and the Type I and Type II Zehna), has a groove near the front which is used to pull the guide rod forward and out of engagement with the rear post of the barrel. The guide rod is then displaced to one side or the other and locked in the forward position. At this point the barrel can be lifted out of the frame. An indent in the back of the magazine, facilitated by a half-moon cut in the baseplate, fits into the groove on the guide rod and is used to pull it out for disassembly. The second innovation involves the safety. The magazine cannot be removed unless the safety is on. The safety cannot be released until the magazine is reinserted. Hence, if a round is left in the chamber, it cannot be accidentally fired when the magazine is removed. With the safety on, the gun cannot be cocked, but the slide can be retracted in order to eject a round in the chamber. The Schmeisser Pistol was touted as being safe even for people who are unfamiliar with guns. Matthews states that production of the Model I began in 1920. However, it did not receive its Model I designation until the Model II appeared in 1927. Before that, it was simply known as “die Schmeisserpistole.” The gun was available in blue or nickel finish. There are two variants of the Model I slide. First Variant Model I: The first variant Schmeisser Pistol is distinguished by the distinct “hump” at the rear of the slide which rises up to form the rear sight. The grips have a monogram of an S intertwined about an H in an oval at the top. I believe the grips are made of hard rubber, as they have a slight greenish discoloration. There are sixteen vertical triangular-cut slide serrations at the rear of the slide. The serial number is on the right side of the frame just above and behind the trigger. The inscription on the left side of the slide is in sans-serif characters on one line and reads C.G. HAENEL SUHL, SCHMEISSER’S PATENT. A few guns have been noted without the comma. If for export, the gun was stamped on the left side of the frame, beneath the slide inscription, “MADE IN GERMANY”. On some guns, the “Made in Germany” was eliminated and the slide inscription included the word “Germany” --so it read C.G. HAENEL SUHL, GERMANY, SCHMEISSER’S PATENT on a single line. Second Variant Model I: The second variant Schmeisser Pistol is distinguished by its smaller rear sight. This change appears to have taken place at least by serial number 70092. I would very much like to collect additional data about these guns to more accurately determine when this change was made. * Eventually (by at least serial number 87192) the comma in the slide inscription was changed to a dash, to read C.G. HAENEL SUHL - SCHMEISSER’S PATENT. The Model II was released in 1927. While retaining the patented features of the Model I, the Model II was completely redesigned, both internally and externally, and reduced in size. Externally, it is a near copy of the Walther Model 9, with a top-mounted extractor, open-top slide, and safety lever behind the trigger mostly covered by the left grip. Like the Walther, the Model II Schmeisser has an external connector bar on the right side which runs beneath the right grip. The connector is held in place by a flat spring beneath the grip. Unlike the Walther, the extractor is mounted externally. The sear on the Model II was completely redesigned--instead of pivoting it moves straight up and down. The slide on the Model II has sixteen fine angled triangular-cut serrations at the rear. The magazine has a half- moon cutout on the front of the baseplate, which fits into the groove in the recoil spring guide rod to pull it out. Production is believed to have ended circa 1930. The serial number is on the bow of the trigger guard, on the right side of the gun. The Model II Schmeisser Pistol has two styles of grip plates in checkered plastic. The first style has an HS monogram in an oval at the top. A reader has pointed out to me that this HS monogram is also a proprietary logo belonging to Siemens-Halske, which may account for the fact that it was eventually changed. The second style of grip plate has SCHMEISSER written across the top of the grip--these grips are made of Trolit, a proprietary plastic made of pressed or injection- molded cellulose acetate. There appear to be two minor variants of the gun, one of which has an additional pin through the the frame behind the trigger. I have been unable to examine a gun with this feature and so I cannot comment on its purpose. The Model II was available in blue or nickel finish. Work the slide to make sure the chamber is empty. Draw the slide back about half an inch. On the Model I the slide can be locked open by pushing the safety up and into the cut in the slide. On the Model II you will have to hold the slide open with your thumb over the top. Using the notch in the magazine (or a tool such as a screwdriver), engage the cut in the recoil spring guide rod and pull it out about a half-inch and over to one side about one millimeter, locking it in the forward position. The barrel can now be removed straight up and out of the frame. The barrels are closely fitted. You may need to tap the gun with a plastic-tipped hammer or pry the barrel up (on the Model I) with a small tool or the tip of the magazine baseplate. Move the recoil spring guide rod back to center so it will spring back into place. Release the safety (on the Model I) and ease the slide off the front of the gun. * Please send your serial number along with photographs or a description of your Schmeisser. I will try to build a database of information about the variants of both the Model I and Model II. I would also greatly appreciate corrections to this article, or additional information about C.G. Haenel and Hugo Schmeisser. Encyclopedia of German Tradenames and Trademarks, 1900-1945, by W. Darrin Weaver. 2010. Firearms Identification, Vol. I, by J. Howard Matthews. Charles C. Thomas, Springfield, IL., 1962. German Handguns, by Ian V. Hogg. Greenhill, London: 2001. German Pistols and Revolvers, 1871-1945, by Ian V. Hogg. Galahad, New York: 1971.